Prepare 2 8" round pans with cooking spray and parchment paper. Whisk together your cake mix, flour, sugar and salt until combined. Add your remaining ingredients and with a hand mixer blend until all dry ingredients are combined. Divide into your prepared pans. Bake for about 30 minutes or until lightly golden and toothpick comes out clean. To make your frosting, beat your butter until smooth. Add in your extracts and continue to beat. Add in your powdered sugar 1 cup at a time until you reach desired consistency, adding milk as needed. Separate about 1 - 1 1/2 cup of your frosting out in separate bowl. Add in your pink food coloring to the bowl with the more frosting and beat until desired color is reached. Mix in your blue food coloring into the smaller bowl and whisk or stir until combined and desired color is reached. To assemble your cake add 1 layer of your cake to cake stand and spread about 1 - 1 1/2 cup pink frosting and smooth to sides. Top with other cake layer and frost cake fully. Add your blue food frosting to piping bag fitted with an open star tip and pipe out swirls on top of cake. Sprinkle cake with shopkins sprinkles if desired. Melt your candiquick until smooth and add in a little gel food coloring at a time, it tries to seize if too much is added at once. Keep adding small amounts until desired color is reached. 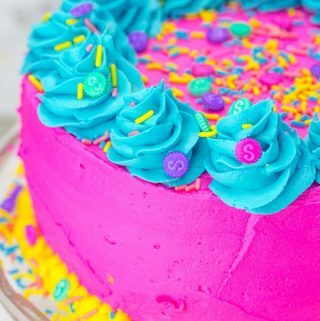 Add to piping bag and cut a small hole in tip and swirl up and down bottom of cake sprinkling with more sprinkles immediately. If you'd like to omit the Candiquick and use frosting instead just reserve a little more frosting from batch and dye with yellow food coloring.